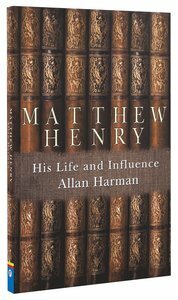 This biography is the fruit of Allan Harman's lifelong engagement with Matthew Henry's (1662-1714) life and writings. Harman explores Henry's background in a committed Puritan family, and follows his ministry and prolific written output through years of ill-health and intense sorrow. 208 pages. About "Matthew Henry: His Life and Influence"
:Matthew Henry (1662-1714) is highly-valued by contemporary preachers and Bible users. Here we get a closer look at the life of Matthew Henry by an author who has had a life-long interest in Matthew Henry and his writings. Matthew Henry was the son of a Puritan pastor who had been silenced by the government of the time. Nevertheless Philip Henry, a godly man reared his family on Christian principles and Matthew followed the Lord from an early age. Although it was difficult to find suitable ministerial training, Matthew Henry eventually studied for the ministry. With government opposition relaxing, he became a Presbyterian pastor in Chester in 1687 and later in London from 1712. It is astonishing to note the amount of preaching and writing that he accomplished despite suffering from ill-health and knowing intense sorrow in his family life.